Ordering and Sales Policies page before ordering. William Henry Gist, Governor South Carolina 1858-1860, left office the same day the Secession Convention met to consider the question of secession following Lincoln's election as President of the United States. 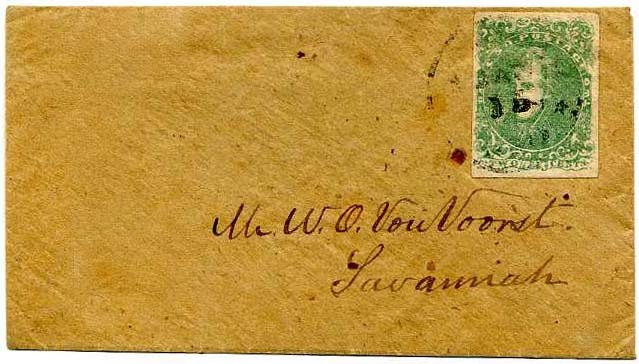 CSA 3, 2c Green with 4 margins tied by light SAVANNAH / GA. // JAN / 15 star cancel on charming diminutive homemade drop cover addressed to Mr. W. O. Von Voorst, Savannah, Very Fine. Delightful and scarce cover, probably Warren Census No. GEO-43 (no photo record of this entry and missing referenced enclosure), classic tiny Dietz guarantee on back flap. SCV $3,500. $2,500. CSA 3, 2¢ light green tied ATHENS / GA // JUN / 23 cds on homemade drop cover, stamp creased by horizontal file fold causing small tear otherwise Fine, addressed to Col. D. C. Barrow, Athens. David Crenshaw Barrow, Sr. was a very wealthy Georgia planter and a trustee of the University of Georgia. His son, David C. Barrow, Jr, would become chancellor of the university in 1906. Ga. SCV $3,500. $950. 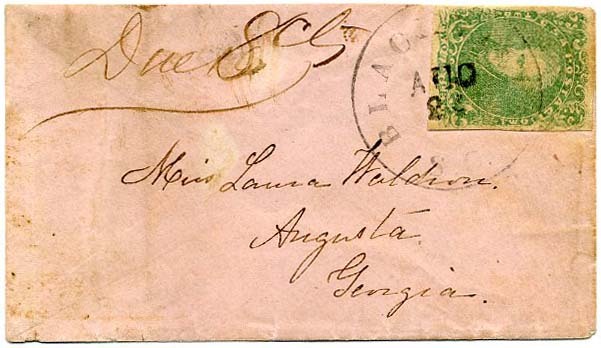 CSA 3, 2¢ green tied BLACKVILLE / S.C. // AUG / 24 cds on small pink cover to Miss Laura Waldron, Augusta, Georgia; with manuscript “Due 8 cts” written over 10 cts for correct rate, bit reduced at top with flap tear, ex Keeling. RARE USE. Sold in 1986 Frajola sale for $2,730 – almost 30 years ago. Ex Brandon. SCV $3,500. $2,000. 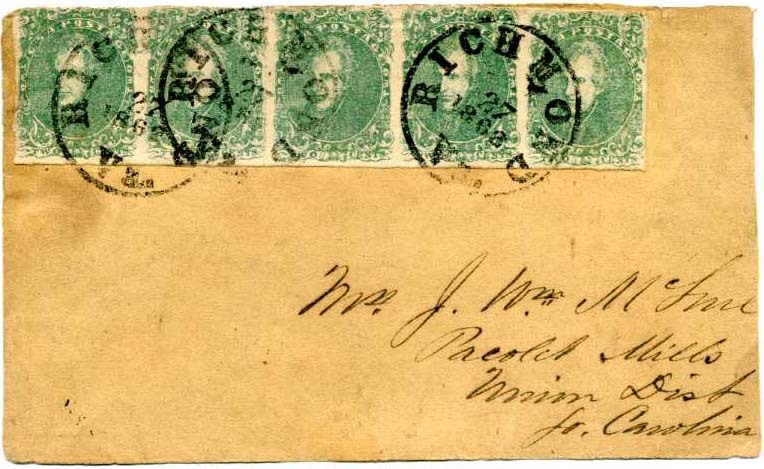 CSA 3, 2¢ green with huge margins on two sides showing part of adjoining stamp at right plus CSA 7-R 5¢ blue single on local paper, large to huge margins including left sheet margin, tied together by partial RICHMOND / VA. (month?) 19 / 1862 cds on homemade cover to Miss Mary E. Hoover, Williamson's Mills, S.C., Fine and VERY RARE COMBINATION “representing an underpayment of postage that got by” as expressed on the included 1993 CSA Certificate, ex Wiltsee, Everett and Brandon with pencil guarantee by Robert Laurence (Laurence & Stryker) on verso. $2,500. Major Hutson Lee (1843-1899) was a Quarter Master in the Confederate Army at Charleston. His 1858-1865 papers are in the South Carolina Historical Society which include broadsides for the sale of his slaves at auction, QM documents from the war concerning supplies, blockade runners, medical services, and one letter complaining of the inhumane treatment of prisoners at Columbia. 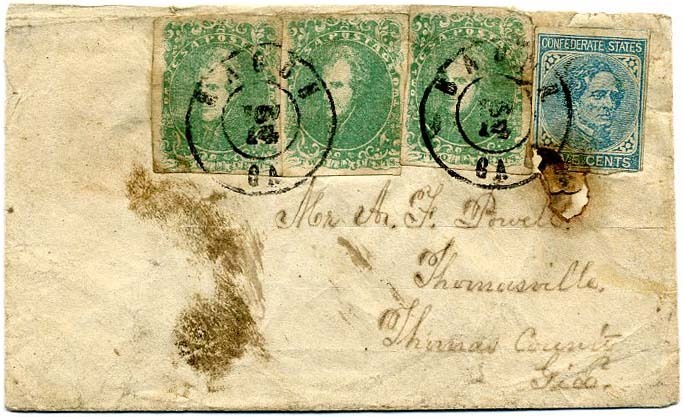 CSA 3, 2¢ green, three singles, each with full margins (one has pre-use crease), used with CSA 7, 5¢ blue, tied by double strike of MACON / GA. // NOV / 14 double-circle on small cover to Miss A. F. Powell, Thomasville Ga.; minor faults including small piece out of top and flap missing, ink smears, one stamp partly eroded and reinforced, nevertheless a wonderfully restorable cover, EXCEEDINGLY RARE COMBINATION, OVERPAYING THE 10¢ RATE, signed Dietz, ex Keeling and Brandon. $1,900. 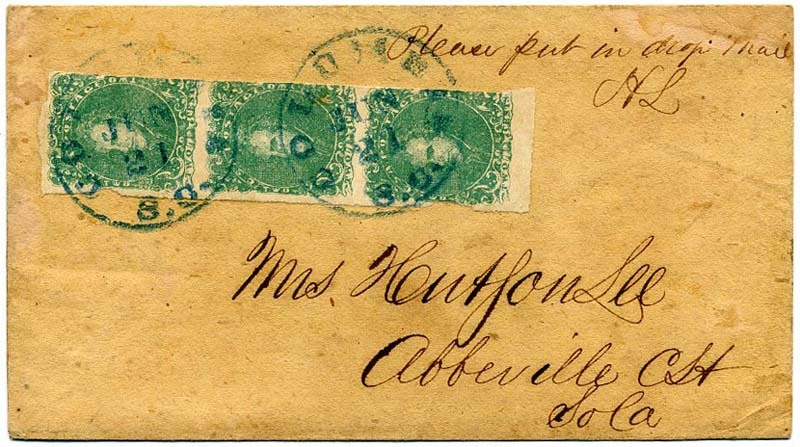 CSA 3, 2¢ green tied by CHARLESTON / S.C. // NOV / 4 / 186_ cds on cover to John E. Rivers, Charleston, So. Ca. drop use cover, professionally repaired at top edge and stains removed, slightly affecting the stamp, open most of 3 sides. Contents docketing “Wm DeSaussure & Son, Nelson Mitchell & Wm McLeod” in pen as well as pencil docketing “N. M. announces intention to dispute the will.” SCV $3,500. $1,300. 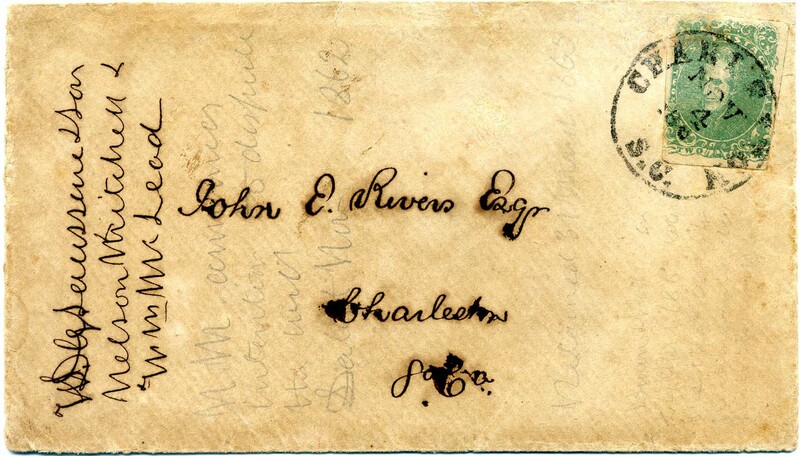 John E. Rivers, Jr. (1819-1878) was a Charleston attorney and planter, the son of John Elijah Rivers, Sr. (1793-1850), a James Island SC plantation owner. The Rivers family papers (1825-1883) are housed at the South Carolina Historical Society. Included are bond holdings, slave sales and mortgages, land transactions and more. CSA 3, five singles (couple with small edge faults) tied triple strike of bold MARIETTA / GEO. // APR / 16  cds on legal sized cover to Wm. F. Ritchie, Esq, Richmond, Va. with manuscript “Due 10” for underpayment. 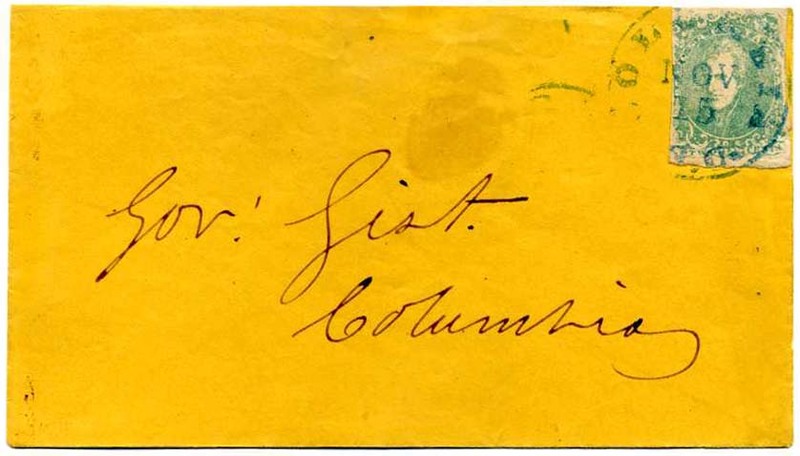 Docketing on back flap indicates it was sent from “S. Isidor[e] Guillet, Lieutenant & Post Adjutant, Marietta, Geo Ap[ril] 16/64.” FASCINATING BACK STORY of young officer killed at the Battle of Columbus on the same horse on which three of his brothers were also killed. Story in one of my upcoming columns. Cover with strip of five CSA 3 catalogs $13,500. $5,500. Guillet, S. Isidore was killed in action at the Battle of Columbus on April 16, 1865, the last formal battle of the war. William F. Ritchie was a printer and publisher in Richmond and served as the Public Printer for the state of Virginia. Much more information on both men on linked page. 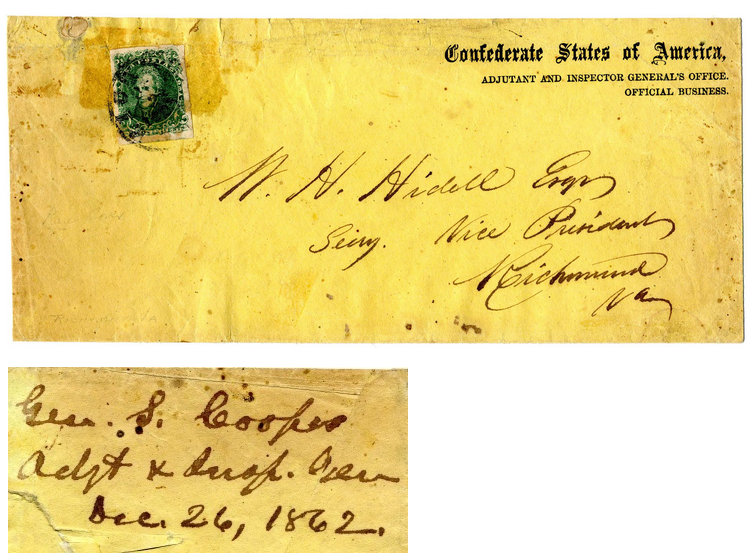 CSA 3, 2¢ green, large margins all around, some gum staining, tied by RICHMOND / Va. // DEC/ 26 / 1862 cds on legal-size drop cover with scarce "Confederate States of America Adjutant and Inspector General's Office" semi-official imprint (CSA Catalog type WD-AG-07), addressed to [Col] William H. Hidell who was private secretary to Confederate Vice President Alexander Stephens, docketing on reverse "Gen. S. Cooper Adjt. & Insp. 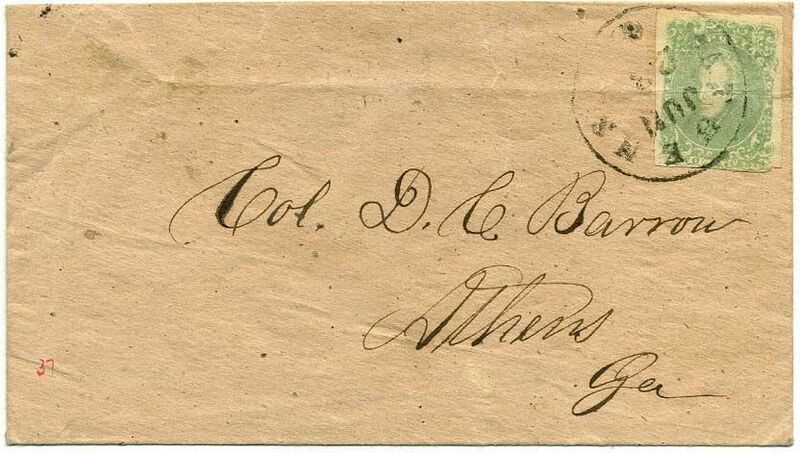 Gen. Dec. 26, 1862", missing back flap as usual for this correspondence, some wear and staining, still a very presentable and extremely rare use. 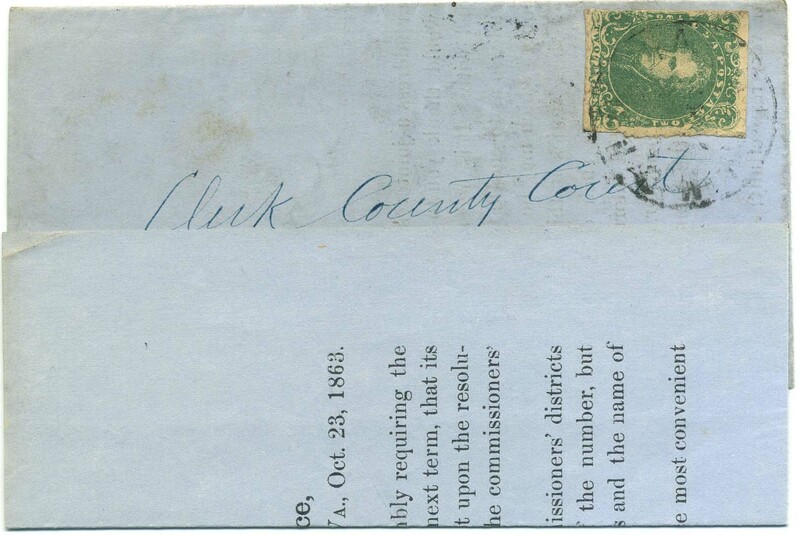 It appears that a pair of stamps was originally under the 2¢ stamp. 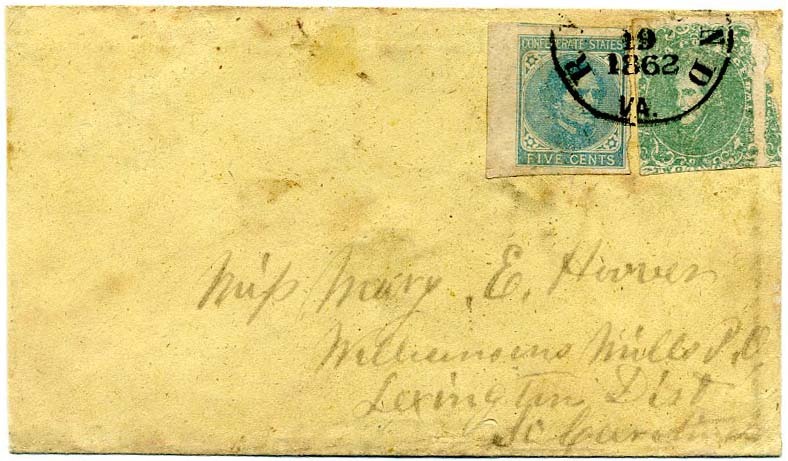 It was not uncommon for pairs of 5¢ stamps or single 10¢ issues to overpay the drop use when carried to Richmond from out of town by courier and dropped in the mail for local delivery. My personal speculation is that a pair of uncanceled stamps was removed for use elsewhere and the appropriate 2¢ drop rate stamp use instead. Fascinating backstory which will be written up in one of my columns. $1,850. General Samuel Cooper was adjutant and inspector general of the Confederate States army throughout the entire war. When President Davis fled Richmond after Lee's surrender to Grant at Appomattox, Cooper fled with him. Much more information shown on linked page. Colonel William Henry Hidell (1843-1906) served as the personal secretary to Alexander Hamilton Stephens, Vice President of the Confederate States of America. Much more information shown on linked page. 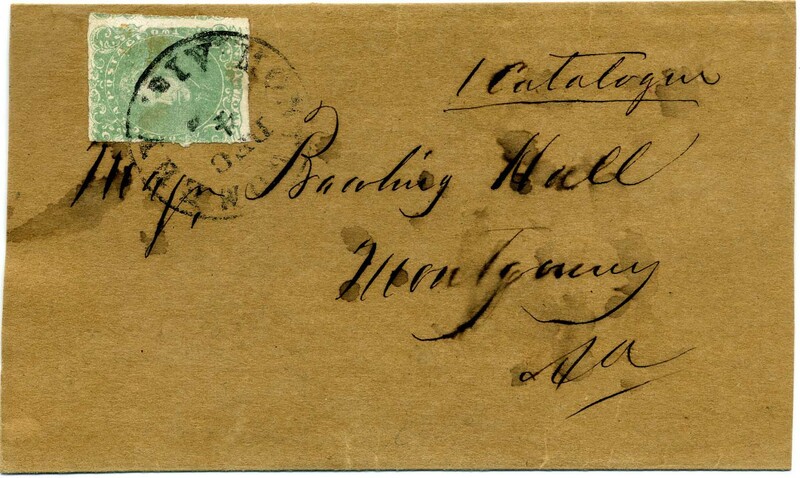 CSA 3, 2¢ green with large margins to slightly in at left, tied by MONTGOMERY / ALA. // DEC / 4 / 1862 cds on wrapper marked "1 Catalogue" and addressed to Major Bowling (sic) Hall, Montgomery, ink slightly smeared, nice combination of printed matter and intra-city use, WRAPPERS ARE MUCH SCARCER THAN DROP USES, illustrated in Dr. Daniel C. Warren's census of 2¢ lithograph covers (2011 Congress book, p. 33, Census No. ALA-13), 1993 CSA certificate. ex Everett and Warren. SCV $3,500. $1,900. Bolling Hall was a colonel in the 59th Alabama Infantry. Much more information shown on linked page. 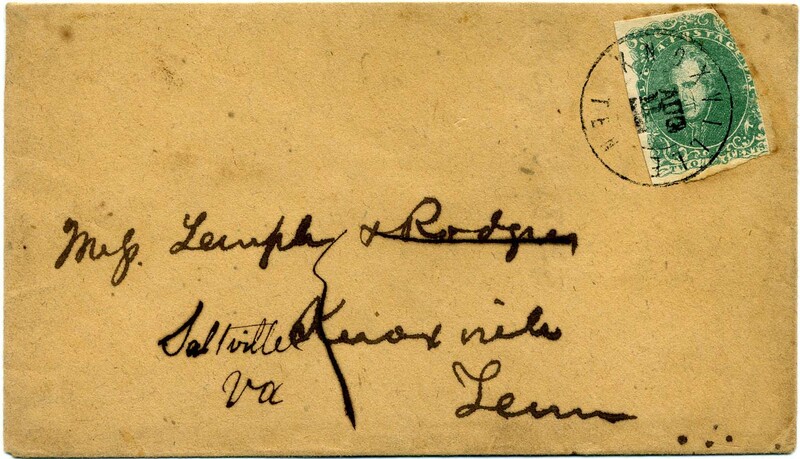 CSA 3, 2¢ green tied by neat KNOXVILLE / TEN // AUG / 11 double-circle datestamp on cover to Messrs. Temple & Rodgers, Knoxville, Tenn., which has been redirected to Saltville, Va. with “& Rodgers” crossed out of address. This is a bit of a rate puzzler. The circular rate was 1¢ if posted in the same office at which delivered. It was 2¢ if posted to another town. This is a forwarded use and not charged additional postage for forwarding, which should only have been the case with a circular rate. The back flaps were also sealed, which again should not have been the case with a circular. Thus, my conclusion is that it was a drop use for which the postmaster mistakenly did not charge for forwarding. Ex Boshwit, Cipolla and Felton. Warren Census #TN-003. Pictured in the 2011 Congress Book on p. 51, SCV $3,500. $1,900. 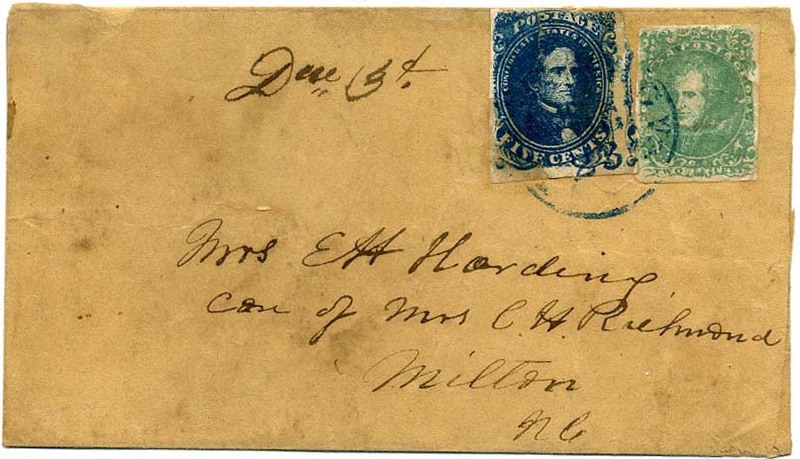 CSA 3, 2¢ green, pre-use tear, used in combination with CSA 4, 5¢ dark blue, approximately one-third of stamp has been replaced with a piece in identical shade, both stamps tied by blue PETERSBURG Va. // DEC / 23 cds on cover to Mrs. E. H. Harding, Care of Mrs. C. H. Richmond, Milton, N.C. Manuscript "DUE 3¢" FOR 10¢ RATE, minor wear, A REMARKABLE MIXED FRANKING, Nicely restored, Ex Keeling. $1,800. 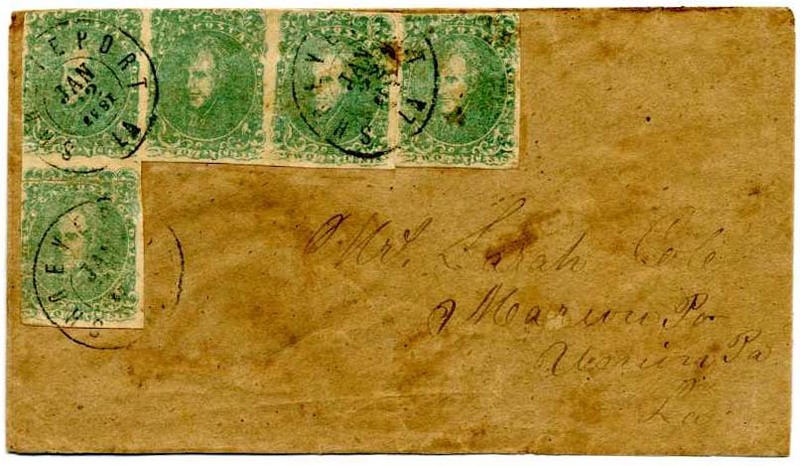 CSA 3, 2¢ green right sheet margin, tied bold blue ALBANY / Ga. // SEP / 16 / 1862 cds on homemade cover to Capt. Wm. 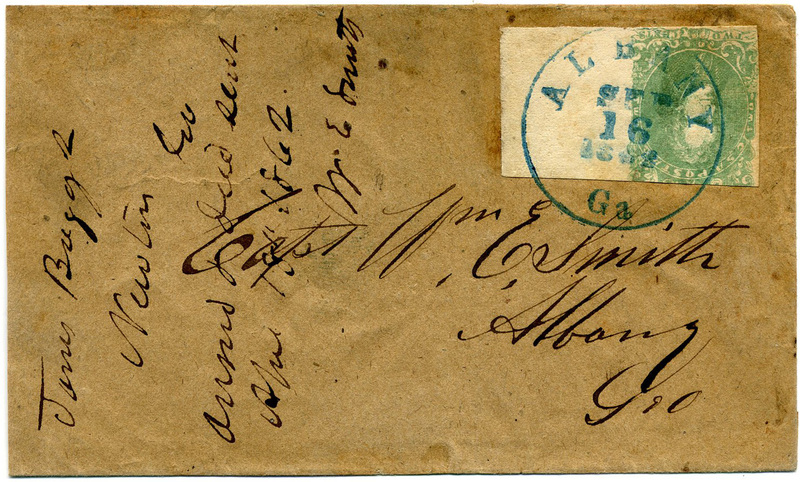 E. Smith, Albany, Geo with docketing from James Briggs, Newton Ga, slightly reduced at left. Nice drop use with sheet margin copy. Ex Brandon. SCV $3,500. $1,900. CSA 3, 2¢ green with large margins to barely touched at lower left, tied by partly clear strike of RICHMOND VA. cds on Oct. 23, 1863 Auditor's Office printed notice announcing a Confederate General Assembly joint resolution concerning Commissioners of the Revenue, addressed to the Clerk of the County Court at Dinwiddie C.H. Va., Very Fine, unlisted in Warren Census, with 1980 CSA certificate, SCV $3,500. $1,900. 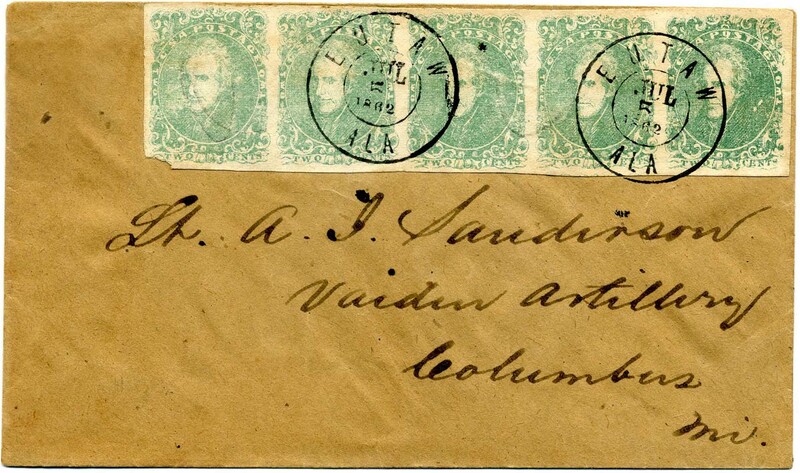 CSA 3, 2¢ green strip of five, light pencil markings, faint diagonal pre-use crease which is slightly rubbed, large margins all around, bottom left corner slightly irregular, tied by two strikes EUTAW / ALA // JUL / 5 / 1862 double-circle datestamp on pristine brown paper cover to Lt. A. J. Sanderson, Vaiden Artillery, Columbus Miss. 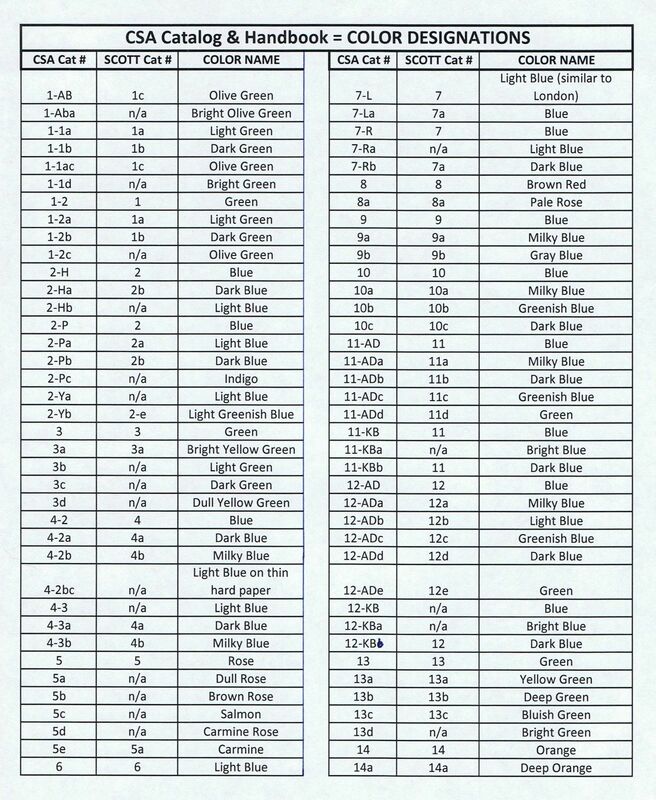 Dr. Warren Census of 2¢ lithograph covers (2011 Congress book) lists only two covers used from Eutaw; this is No. ALA-001. SCARCE SHOWY STRIP PAYING THE 10-CENT RATE. Stellar provenance: Ex Brooks, Emerson, Finney, Duckworth and Kilbourne, SCV $13,500. $5,500. Alexander J. Sanderson served in Company L (Vaiden Artillery), Mississippi 1st Light Artillery. Much more information on linked page. © 2019 trishkaufmann.com All Rights Reserved.